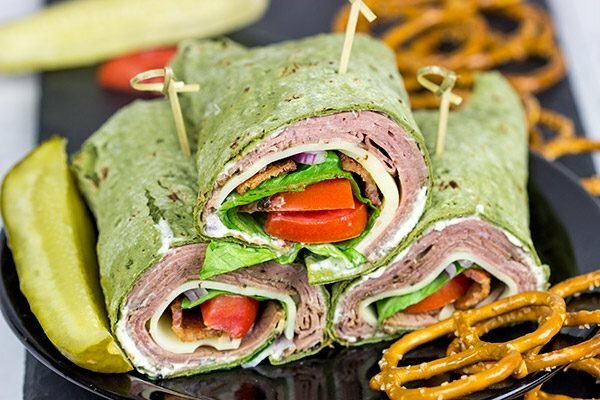 Pack a delicious lunch with these Roast Beef and Swiss Wraps with Horseradish Mayo! Your coworkers and classmates will be jealous! I love cheese. I’d honestly have a hard time picking a favorite. Perhaps a good, extra-sharp cheddar cheese. Perhaps a good, stinky blue or even a softer camembert. Or perhaps an aged Dutch gouda. Our Rhine river cruise this past summer left from Amsterdam, and Laura and I chose to go over a couple of days early to explore the city. This was our second time in Amsterdam, and we honestly love that city! I’ll have to write a post about Amsterdam at some point, but for now I’ll just say that we spent an inordinate amount of time in Dutch cheese shops while we were there. Aged Gouda is a thing of beauty! Traditional research holds that the eyes in Swiss cheese come from the bacteria that is included in the milk. As the cheese ripens, the bacteria releases carbon dioxide. This carbon dioxide is trapped in pockets in the cheese, and thus it gives Swiss cheese it’s well-known appearance. But at least one recent study argues that the eyes develop from hay particles falling into the milk. The eyes in Swiss cheese have been gradually disappearing over recent years. This study explains this occurrence by saying that milking procedures have improved, and hay particles are less likely to be found in the culture. To be fair, this study hasn’t been peer-reviewed yet, so it should be taken with a grain of salt…or a grain of hay. Oh, and did you know that the USDA regulates the holes in Swiss cheese must be between 3/8″ and 13/16″? 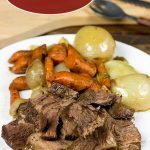 And to take these Roast Beef and Swiss Wraps to a whole new level, I whipped up a quick and easy horseradish mayo as the base. I’m not a huge mayo fan, but I do find it delicious when used in sparing amounts on sandwiches and wraps. Since horseradish pairs so well with roast beef, I decided a bit of horseradish mayo was just the thing for these wraps. The kick from the horseradish is quite tasty in these wraps. But I do recommend being sparing with it…that is, unless you want to clear your sinuses out! 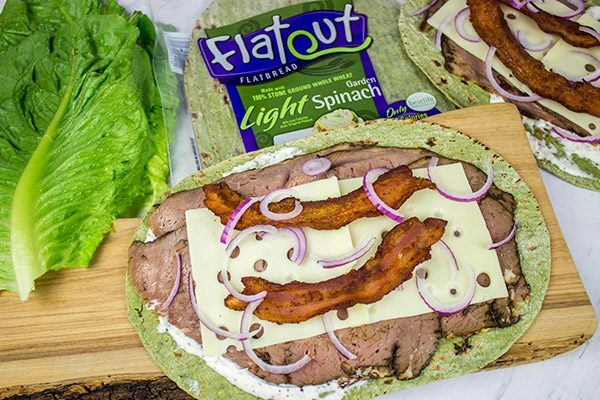 I used Flatout’s Light Spinach flatbreads for these wraps, and the flavor was spot-on! Each flatbread brings 8g of whole grains, 9g of protein and just 90 calories. 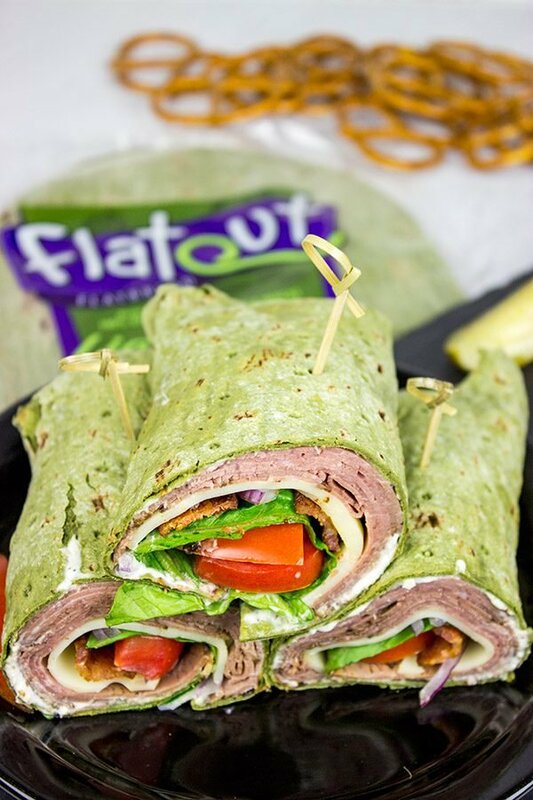 We try to keep our lunches pretty healthy around here, and Flatout wraps are perfect for that. It should come as no surprise, but we’ve always got at least one package (usually more) of Flatout flatbreads in our pantry. They’re perfect for quick meals, and they’re quite healthy, too! Looking for other wrap ideas? How about these Thai Peanut Wraps or even these BBQ Chicken Pinwheels? 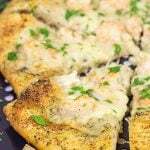 If you’re wondering where to find Flatout flatbreads in your area, then check out their store finder here! And I leave you today with a fun quote that my sister recently shared with me (well, she shared it with Robbie…but close enough): Start each day like it’s your birthday, and leave a little confetti everywhere you go! Enjoy the day, my friends! 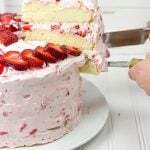 Using a small bowl, whisk all ingredients together until well blended. Using a large skillet, cook bacon until crispy. Pat dry with paper towels and set aside. 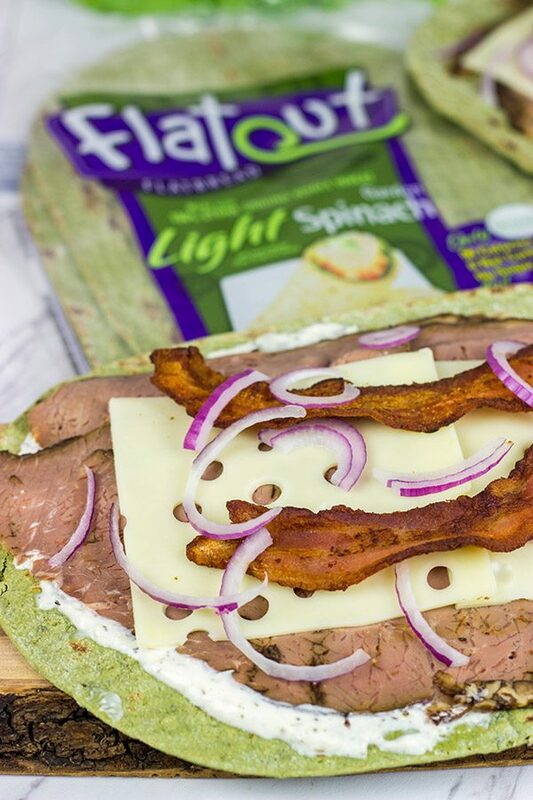 Lay Flatout wraps out and spread 1½-2 Tbsp of Horseradish Mayo onto center portion of each wrap. 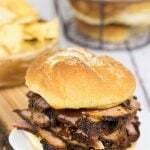 Divide roast beef, Swiss cheese, cooked bacon, lettuce, tomatoes and red onions evenly down center of wraps. Tuck edges in and roll wraps tightly. Disclosure: This Roast Beef and Swiss Wraps with Horseradish Mayo post was sponsored by Flatout Flatbread, but the recipe and opinions are entirely my own. Thank you for supporting the brands that support Spiced! I love the quote from your sister. That’s a great way to live your life. Also, I always wondered why there were holes in Swiss cheese, now I know. Thanks! Love this wrap. It would make a delicious lunch. 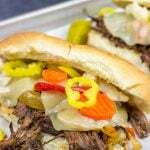 The horseradish mayo sounds wonderful on the sandwich! I agree, Dawn! That really is a great quote, and it’s stuck with me ever since I heard her say it. 🙂 So I was the same as you with Swiss cheese. I always wondered where the holes came from! Check that on off the list of things to google now! This wrap is insanely delicious…and it’s super easy to make, too. Thanks so much, my friend! I hope life isn’t getting too crazy for you yet! Please tell me Robbie took your sister literally and is now leaving a trail of confetti everywhere he goes :). Just for clarification–cheddar, for example, would be a blind cheese? That’s so interesting! Will Swiss be considered blind if the holes disappear completely? Why am I such a nerd that I’m going to spend my weekend researching this? Don’t answer that one. These wraps sound AWESOME! Horseradish happens to be one of my condiments! Cheese is an amazing product. 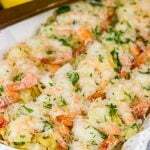 I often wonder how it’s possible to make so delicious and versatile product basically with a few major ingredients. Milk, salt, and bacteria + different techniques = hundreds (thousands?) kinds of cheese. How cool is that, David, right? Also, I remember your post from a long time ago where you confessed you had a thing with mixing the letter’s order in “horseradish”. Since that post, almost every time I see this word, I start to smile…and also mispronounce it haha. And these wraps are amazing and rather healthy so I’m taking 4…or 6! Have a nice weekend. I’m with ya, Ben! Cheese really is amazing. I also put bread into that same amazing category. It’s really just salt, water, flour and yeast but it turns into such an amazing final product! Wow, you have an amazing memory, my friend! I do indeed still mix up the letters in horseradish…and Laura makes fun of me every.single.time. Haha! Either way, thank you so much for the comment, my friend. I hope you had an amazing weekend! Hi David! These sound delicious! I love wraps because of the “bread” to filling ratio, more filling and less bread. These would be great for a picnic or a party, where you could set out various filling and let your guests build their own! We love horseradish and use it often with (think rare prime rib and shrimp cocktail). 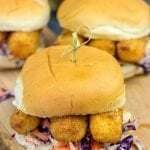 These are also perfect for school/office lunches! I never gave a thought as to why Swiss cheese has holes, I just know I like it! David, sometimes I can’t believe the weird commonalities between us. I’ve been on a taking-my-lunch-to-work kick, which I haven’t done in decades, and this week it’s been wraps. And then I read that you’re suggesting lunch wraps. But just when I start to think you we must be somehow related, you claim not to be a huge mayo fan? There cannot be enough mayo on a sandwich for me. I’d slather a mayo sandwich with mayo. That’s great advice from your sister! And all that swiss cheese trivia is really interesting. I would love to find this wrap in my lunch box. Why would’ve thought my little sister would be the fountain of advice? Hah! But seriously, that quote really is pretty fun. 🙂 These wraps are also pretty darned fun (and tasty), too. I’ll sneak in and hide one in your lunch box for today, ok? Thanks, Rachelle! I love wraps and this combination is top notch! Love that horseradish sauce! I’m right there with ya, Kathy! 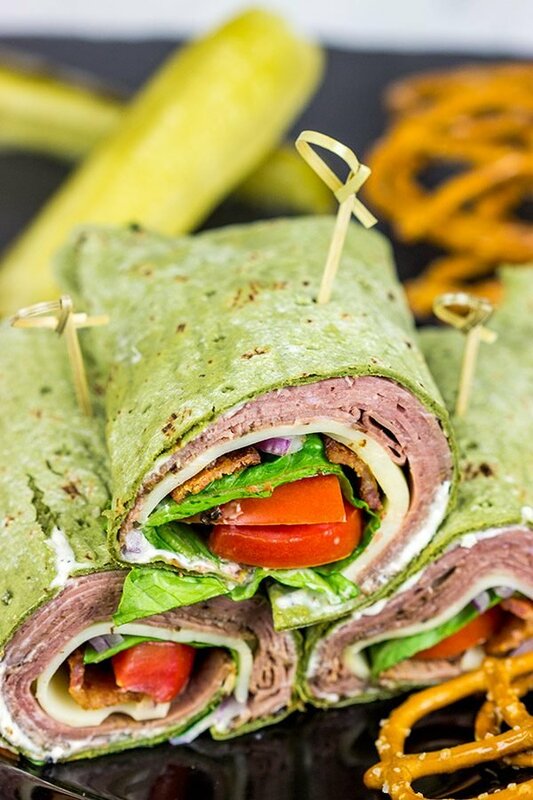 I good wrap is hard to beat, and this horseradish sauce takes these wraps to a whole new level. 🙂 I hope you had a great weekend, my friend! That horseradish mayo sounds delicious and I’m thinking I kinda need this wrap for lunch 🙂 Happy Monday! Oh, I totally agree with you about cheese, Dawn! In fact, Laura and I just ate soft cheese and a French baguette for dinner the other night…and it was amazing! 🙂 So these wraps are definitely a new favorite around here. The horseradish mayo takes ’em to a whole new level. Give ’em a shot! Thanks so much, my friend! I’m kind of like you in the sense that my favorite cheese is really whichever one I am eating at the time – I could never choose. Swiss is so nice and melty and nutty, though, it always makes a great sandwich! Thanks for the recipe and the primer on hole-making in Swiss cheese! Haha…I totally agree with you! My favorite cheese is whatever I happen to have in my fridge. That’s usually a good, sharp cheddar cheese, but I love all cheeses! Swiss is one of those underappreciated cheeses, though. It really is amazing on sandwiches and wraps! 🙂 Thanks so much, my friend! By the way – I had no idea that there were regulations as to the size of the “eyes” in swiss cheese…and I had no idea they came from hay… I gotta say, dude, love coming by here and learning something new just about every visit! Now I was gonna head to the gym but you have me craving a wrap! Guess I better do a detour and stop by the grocery store for some Flatout spinach wraps! You are so right, Shashi! Sprinkle some confetti out there today, ok? 🙂 So I didn’t realize there were such regulations in the Swiss cheese industry, either…but it makes total sense, right? I mean you gotta protect the integrity of the Swiss cheese! Hope the gym is treating you well right now, my friend. That’s why we like to get up and get it over with early in the morning!